Recognizing a need to support the participation and leadership of women in the UN climate negotiations, particularly from countries most affected by climate change, in 2009, the Government of Finland partnered with the Global Gender and Climate Alliance (GGCA) and the Women’s Environment and Development Organization (WEDO) to launch the Women Delegates Fund (WDF). In recent years, contributions from the Governments of the Netherlands, Australia, Canada, Iceland, and Switzerland have helped strengthen the programme. 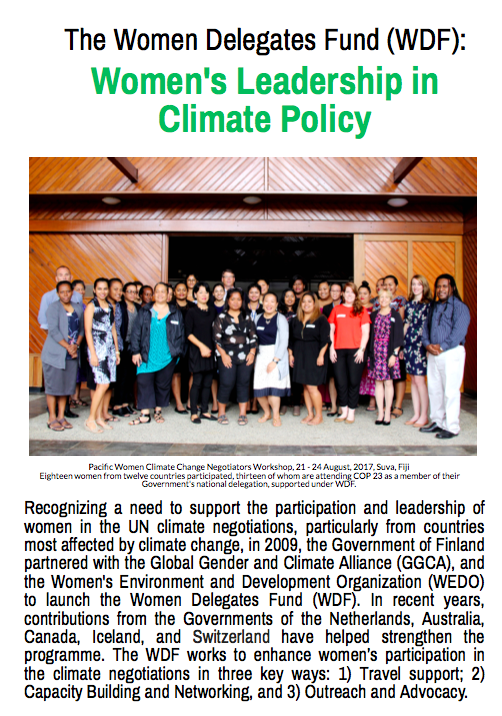 The WDF works to enhance women’s participation in the climate negotiations in three key ways: 1) Travel support; 2) Capacity Building and Networking, and 3) Outreach and Advocacy. WEDO has been administering the programme, and at COP 23, the Fund supported 20 women from 21 countries to participate in UNFCCC negotiations as members of their national delegations. Learn more facts here.